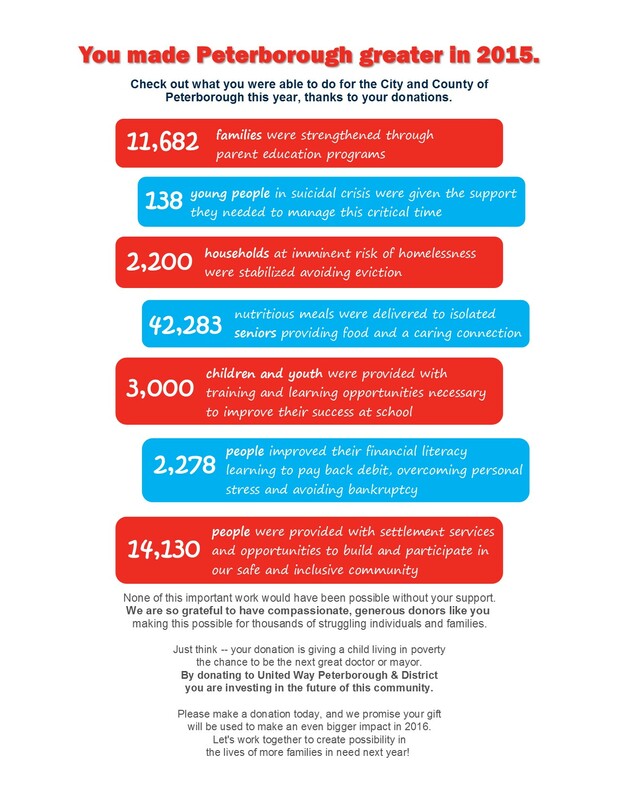 This year’s campaign is seeing an unprecedented shortfall in the money raised for investment in our community and UWP is seriously concerned about the people who will require the services of partner agencies. With only weeks left in the campaign, an all-out effort is required so this trend doesn’t result in vulnerable people in our community being impacted. Please donate online, or call 705-742-8839 to give by Visa or MasterCard. Visit the United Way office at 277 Stewart Street to make a donation in person. Let’s not risk deeper isolation for a senior, a homeless youth spending another night on the street or a deepening isolation for someone suffering from a mental health or addictions issue. Together, we are possibility. Your donation to United Way is an investment in the future of this community.